Election projections can go either way, but this one looks like a pretty resounding sweep. The Liberal Party's Justin Trudeau is Canada's new prime minister and will likely form a majority government, according to multiple news outlets' projections. The Canadian Broadcasting Corporation and CTV News put the 43-year-old ahead of longtime incumbent Stephen Harper, who was Canada's head of government since 2006. The speedy 78-day campaign, which puts beleaguered American politics to shame, had Trudeau, Harper, and Thomas Mulcair of the left-wing New Democratic Party in an even race. But early numbers showed the Liberals had quite easily toppled the Conservatives in power. The Guardian has put the Liberals with 57.9 percent of the vote, Conservatives with 19.9 percent, and the NDP with 17.5 percent. Trudeau is the son of two-time past PM Pierre Trudeau, who led Canada from 1968 to 1979, and again from 1980 to 1984. (Canada doesn't have term limits for its prime ministers.) Some doubted Trudeau's ability to lead and argued he lacked his father's brilliance and intelligence, but his platform for increasing taxes on the rich and defending the religious rights of Canadian Muslims appeared to resonate with voters. 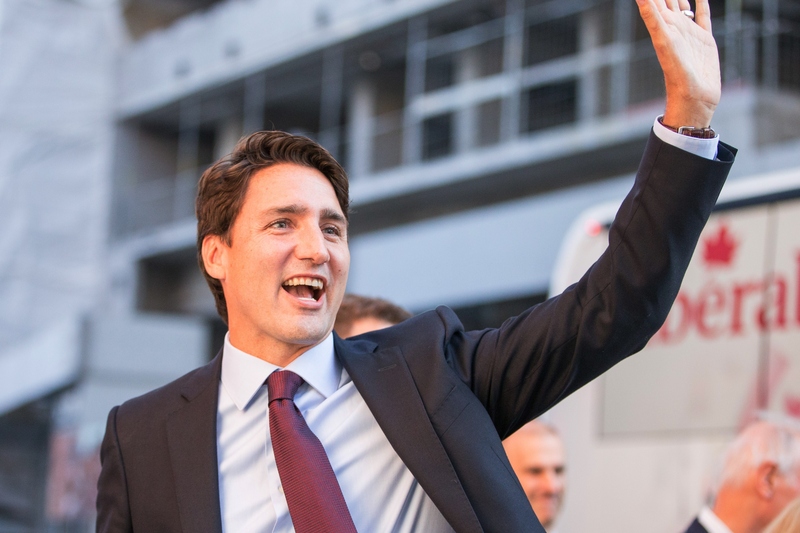 The win would make Trudeau the North American country's second-youngest leader in history. The longest election in Canada's history could usher in a new phase for the country. If you're wondering just why Canada's election matters to America or why this was actually a race to watch, just ask John Oliver and Mike Myers.